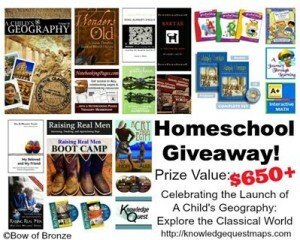 A Child’s Geography: Explore The Classical World ~ Review and Giveaway! 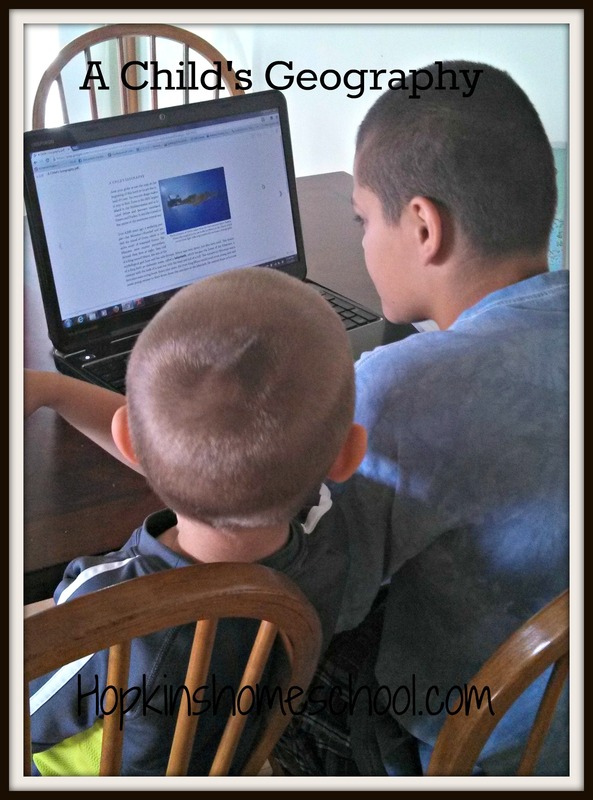 I am still "new" in the homeschool and blogging worlds, but I have been learning fast what the good for us curriculums are. When I was looking for ideas for Big Kid and his history and geography needs, I found Knowledge Quest and feel in love with what they had to offer. But which should I choose? I was offered the opportunity to be a part of the team for A Child's Geography Vol. III: Explore the Classical World. Since I was still in the middle of deciding what I wanted to use, I figured I would "give it a try". Man, did I fall in love! 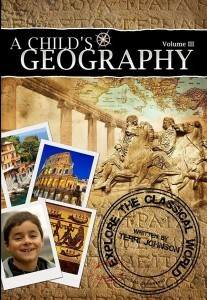 A Child's Geography: Explore The Classical World is geared towards grades 1-6. Big Kid is starting the 7th grade this year and loved this program and Ray Ray is in Kindergarten and loved listening, so I agree with the grade recommendations on this. I received the eBook version, which sells for $24.95, but you can also order the soft cover physical copy of this for $34.95. I consider this an awesome price for what you get!! When we got our copy, the first thing I did was print a copy of the map. We taped in on the front cover of a simple composition notebook so we could keep our travel journal in one place. After that was done, we were ready to go!! What made this even more fun for use this year, was we were going to Mt. Olympus in Wisconsin Dells…and when we started reading, it was all about that time period. So, not only were my kids learning, but they were putting what they learned into their memory and relating it to something. Yes, I know, a waterpark is not really "school" related, but as we were walking around and my kids start telling me bits and pieces of what they read, I considered that a good thing! Places like Mykonos, Athens, Rome and things like the Trojan Horse, all came to "life" for my kids on this trip. We came home with questions and a renewed interest in learning more about this area and its history. My kids love to sit down and look at the pictures, which are beautiful and real! And I have printed my own copy of the book (because I don't like to read on the computer or tablet ALL the time). Not only do we have the fun book to read, but we are also able to follow along with our maps and mark off the cities and countries we visit along the way. There are two different maps to use for this, the ones with the cities listed, I use these for Ray Ray and we just highlight where we are talking about. 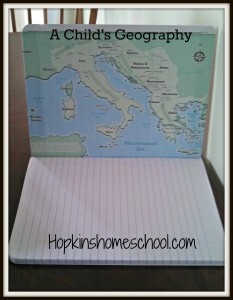 Big Kid uses a black map and finds the cities using the latitude and longitude lines. He is than able to mark the cities and countries as we go. And what history and geography curriculum is complete without recipes to go with each area! 🙂 While we learn about that area, we are able to go to the recipe book that shows recipes for each chapter, slava cake and sticky bread anyone?? AND there is more…check out this MEGA giveaway! I haven’t used Knowledge Quest products before but we are about to start using their Around the World Unit Study. I am pretty hyped about it! I’ve never used Knowledge Quest, but i would be very interested in doing so. Yes. We have ACG 3. Thanks for the chance. We used the first volume of A Childs Geography last year, and we just started the second. So excited that there’s a third volume now! Thank you for this opportunity! It looks like a great curriculum! We love Knowledge Quest maps! I haven’t used Knowledge Quest products yet, but I’m looking for next year (already!). I haven’t formally used Knowledge Quest yet – just previewed some things. This looks really good. My son loves history and we are ready for a different look. Thanks. I have not gotten the knowledge quest yet but I am thinking about it. We have not used it before. I have not heard of Knowledge Quest until today, so we have never used any of their products before. I have been reading the reviews and would love to try them! Yes. We are in volume 1 now of ACG! I have only used some free maps before with our history but they’ve been good to use. I have not used their products before. We are new to homeschooling. I have not used any of their products before.